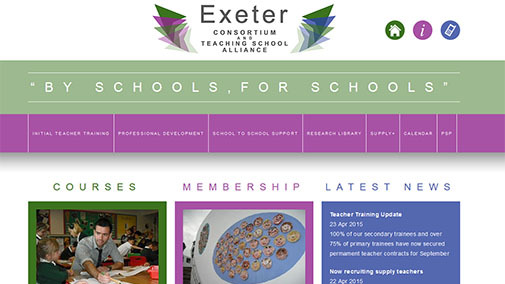 Exeter Consortium (and Teaching School Alliance) came to Cosmic needing a modern, content management system based website in order to display their resources, training opportunities and support options to schools. The website is developed in a popular CMS called Drupal which has a host of great features and technical capabilities which make it the perfect choice for a website of this calibre. The website is mobile responsive which means the templates alter for optimum viewing experience when browsing on a mobile or tablet, which also ties in with the new Google mobile search algorithm.